"The name of the couple is Esther and Abraham Stier,[taken in the 1950's in the USA, at a relative named Honey's wedding]. This picture was given to me by their grandson, Sol for use in a Memory book for his sister Lorretta's 80th birthday. Sol's face lights up when he describes how his grandmother would tease his grandfather and then the grandfather would try to bribe the grandmother. He would then ransom off the children but she would "steal" them from him. The finale of the dance was when the grandfather took the grandmother around and they embraced." Esther andAbraham did this dance at every simkhe they attended. The Stiers were originally from Russia. (Used with permission. Photo provided by M. Schiller on December 20, 2005) Scroll down to read more about this dance. Specific Instructions and ideas for pantomime when doing this dance are in my syllabus. Freehof--female couple version & Lapson-quadrille version). 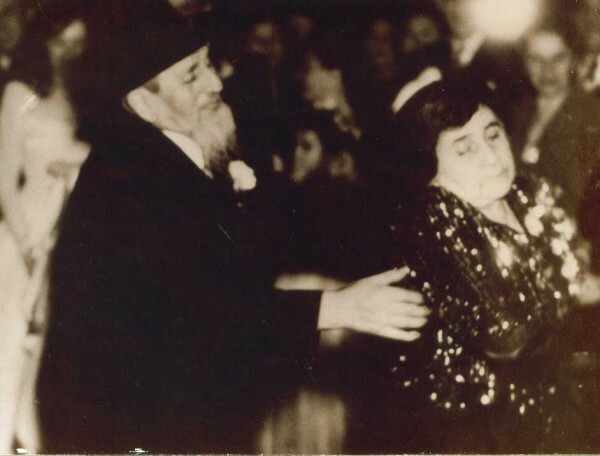 Postings on the Jewish Genealogy network also indicate that in the shtetl there were certain people who customarily danced the Broiges Dance at different community events. These individuals improvised the dance as they went along. The book that comes with the cd "Klezmer Music, A Marriage of Heaven and Earth" explains how this process worked with the musicians and dancers. For another description of a shtetl scenario, see “The Angry Dance” in Jack Kugelmass’s book “From a Ruined Garden.” Here a grandmother believes her son is marrying below his status. She performs this dance at the wedding with the grandmother of the bride, just before the veiling of the bride. An online translation of the yizkor book passage can be found here, scroll to item E. By the end of the dance they have kissed and made up. Scroll down this page to read recollections of this dance sent to me via email. video of myself and folk dancer Judy Silver doing a spontaneous broiges dance a few years ago. The dance was done as long as I can remember at Bar Mitzvahs and weddings. It was mainly in the 50’s and 60’s while our family grew up. I am the oldest living grandchild and I am 70. It always required encouragement from the family. The music was provided by live musicians. It was before the use of disc jockeys at these events. I don’t remember the music specifically. I can only say it was “Jewish”, probably would be considered Klezmer now. I do know there was no vocal on it [instrumental only]. My grandparents’ were born near the “old” Russian Polish border, in 1885-86. They were young married when they came here. They came together. They were probably about 20 when they came. They were the same age. All of the children were born in the US. Mother was born in 1910. [My grandparents] were observant Jews, very traditional. My grandmother was a housewife in every sense of the word. Her interaction with the outside world was marginal. My grandfather was the go between with the world. Neither spoke English well. They did understand but communicated in broken English so we learned to understand Yiddish. Both were functionally illiterate. They were the stereotypical immigrant of the times. My grandfather did work in the steel plants in Detroit for many years. He also hauled junk, delivered ice, and had an opportunity to deliver for “The Purple Gang”. My grandmother didn’t allow it. There was an enjoyment of music. They didn’t listen to records, the radio or attend concerts. They raised me for the most part and I played piano for many years. They did enjoy that music…, they enjoyed classical music if someone turned on the radio, they enjoyed music at family events but I don’t remember them ever turning on a radio independently. The only leisure reading was the Forward. My grandfather had taught my grandmother to read it. They did read Hebrew in the prayer books. There was some kind of feud that left my grandfather estranged from his family. I never knew any of them. My mother did mention them. Apparently they lived in Utica, NY initially. My mother was born there. One of my grandmother’s sister lived there, raised her family there. One uncle was born in Indiana and finally the youngest was born in Detroit. Many of my grandfather’s family were in Detroit. We have not been able to track their arrival through Ellis Island. My grandfather changed his name at his naturalization so he wouldn’t be perceived as Polish. His comment. My grand mother walked around trying to ignore my grandfather. In pantomime he offered hugs, kisses, got on one knee and finally turned his pockets out and gave her the money he had. Then she hugged him. The only activity after they made up were cheers and laughter. The dance was the activity and grandma getting the money was the resolution….General dancing continued after my grandparents finished. "It started out by the male courting the female and that developed into a disagreement followed by the male seeking forgiveness while she was very indignant. I seem to remember a reverse switch somewhere during the dance when the female persued the offended male, after which they got together and then the freylekh celebration came in as they danced off. I'd love to see it performed once more! " where this was discussed further.